In my impression, SanDisk is well known brand in Taiwan for years. My first SanDisk product was CF card for digital SLR camera. After another, I also used or researched other brands CF and SD card. I think memory card is key field of SanDisk. SanDisk has wide range product lines of high spec. memory card. It?s also one of few brands to have SLC products. 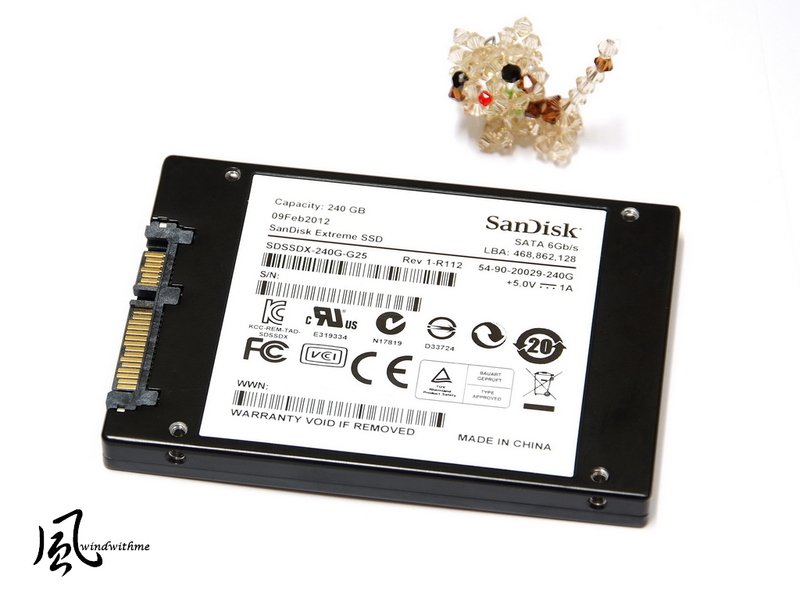 Previously, I saw some SanDisk SSD products from internet were SATA2 and mSATA. I felt they more focus on NoteBook and didn?t see any SATA3 high bandwidth product yet. 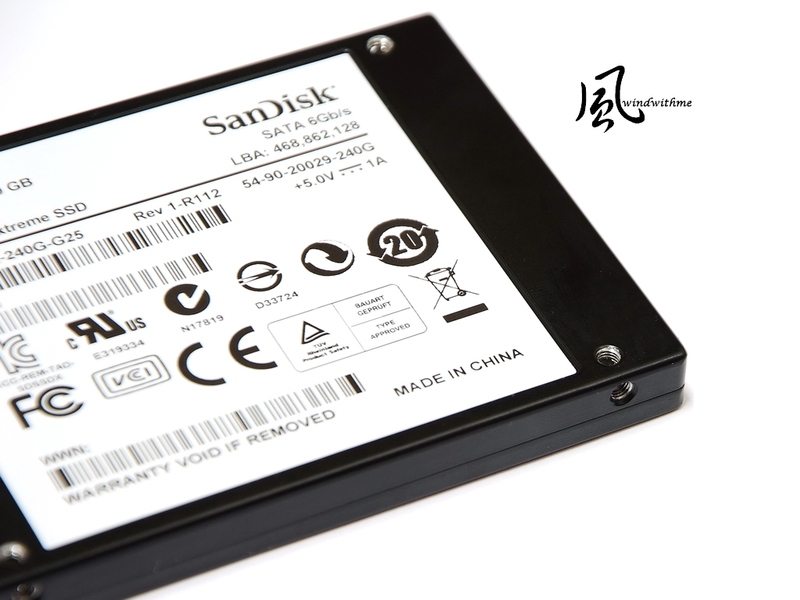 However, in March, I started to see more news about SanDisk SATA3 SSD in internet and market. For current competitive SSD market, launching SSD this stage needs to own real strength and right position. 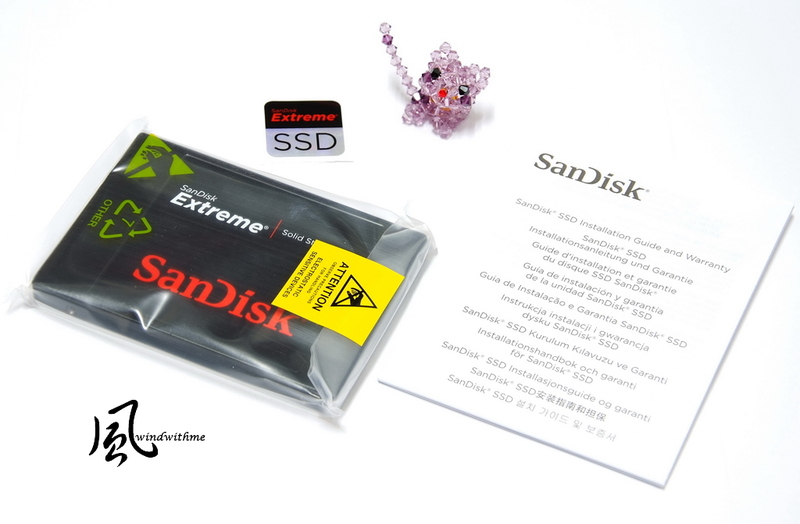 First of all, let?s look at SanDisk Extreme SSD packing. It?s same design style with his memory card. The simple design uses black as main color to combine with red lines or characters. Left side is SanDisk Extreme 240GB and sticker. Right side is multi-languages products manual. If they can bundle 2.5? to 3.5? adapter, that would be better. It?s 2.5? and the capacity is 240GB. In official spec, max Sequential Read/Write is 550/520 MB/s. 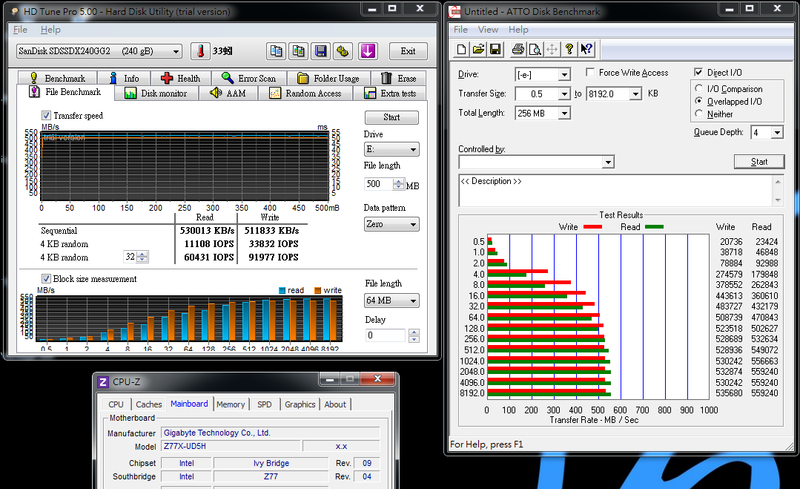 Max random Read/ Write is 39K/83K IOPS. 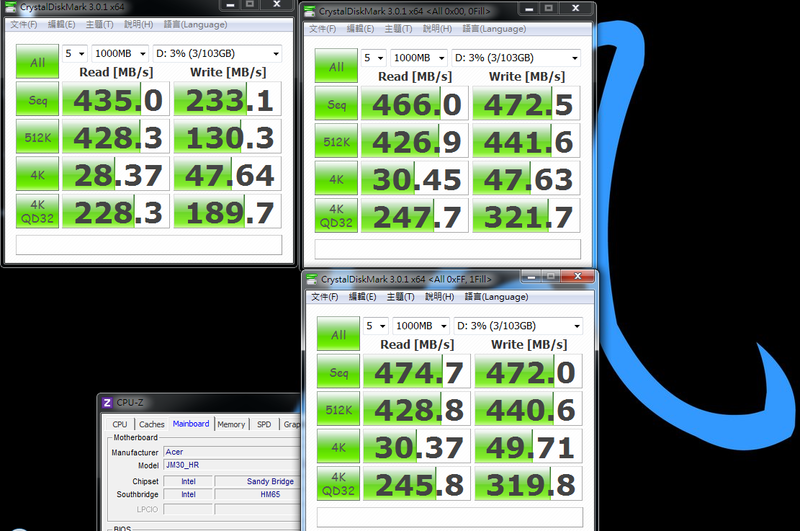 It?s the SATA3 SSD highest spec in the market so far. The model name is SDSSDX-240G-G25. This series has 120, 240 and 480GB. It?s glossy black metal shell. The texture of outlook is elegant. Controller chip is SandForce SF-2281. This chip has launched almost one year. 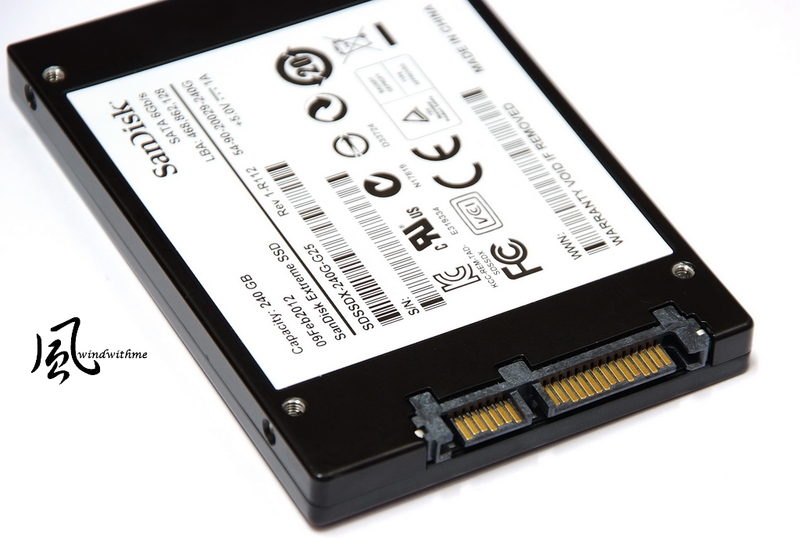 Many major brands SSD are also using SF-2281. Backside sticker shows all safety certificate and information. The screws are under sticker which is different with general design. If you want to see controller and NAND Flash inside, you can search the pictures from internet. As warranty and hardware safety, I recommend you to keep it as original. Lower right is SATA3 and power connector. It?s same as SATA1 or SATA2. You need to check the packing or product spec to know if it?s SATA3 SSD. Screw holes are 2.5? standard. It supports NoteBook. Now, many PC Case also support 2.5? rack. 2.5? to 3.5? adaptor is not really necessary for PC users. 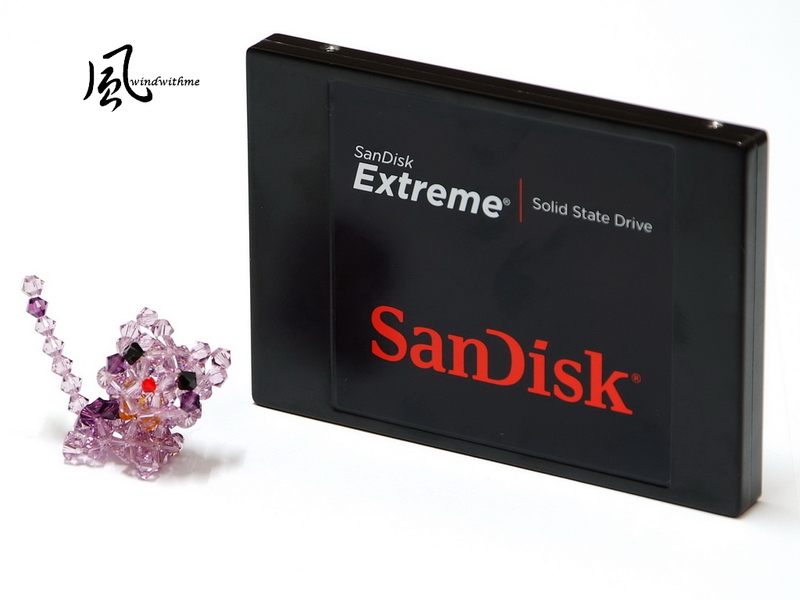 SanDisk Extreme uses SandForce SF-2281 controller. It?s very popular SATA3 SSD controller. It uses anDisk 24nm Synchronize NAND Flash. The individual IC is 32GB. NAND Flash IC is very special. Normally, SandForce SF-2281 bundles with Intel or Micron IC. For the performance, let?s follow on the test result below. First, I use Intel DeskTop platform. 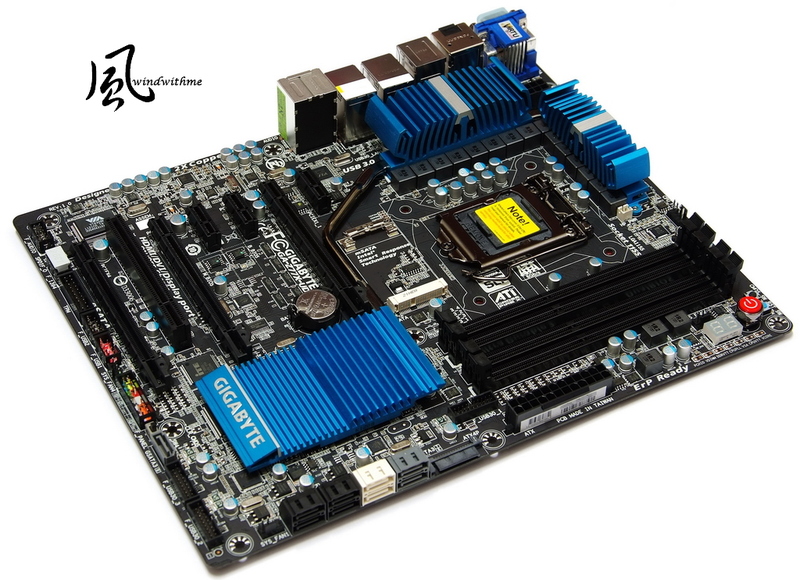 It?s GIGABYTE latest Z77X-UD5H-WB WIFI. It supprts 3 PCI-E X16, 3 PCI-E X1 and 1 PCI. It?s good extensibility in ATX size. Z77 built-in GPU supports simultaneously three outputs. It?s also first time native support USB 3.0. Exclusive BT4.0 and Wi-Fi PCI-E card enhance connection between PC and mobile devices indoor. Intel Z77 is latest mid to high end chipset. It?s getting popular. Intel chipset always gets better I/O transfer rate. SATA3 SSD can have better performance on it. Single SanDisk Extreme 240GB install at white SATA3. 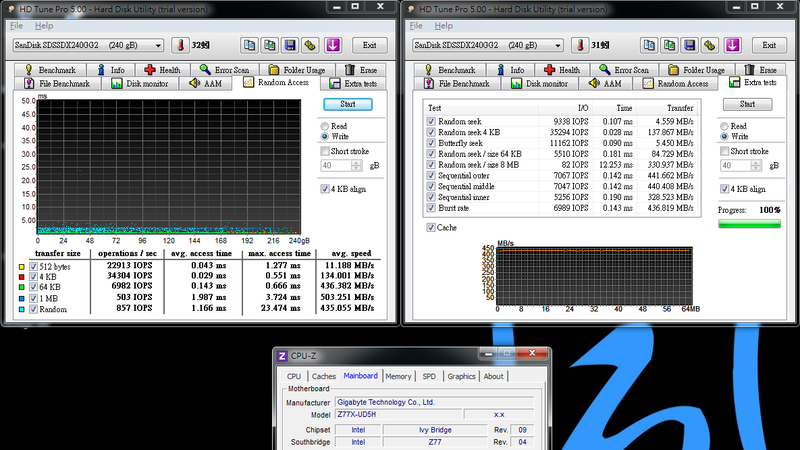 I set it as non-OS drive without any data to test performance on Intel Z77 platform. Black Size is special function of this software. Left side is default 64K and right side is 1MB. 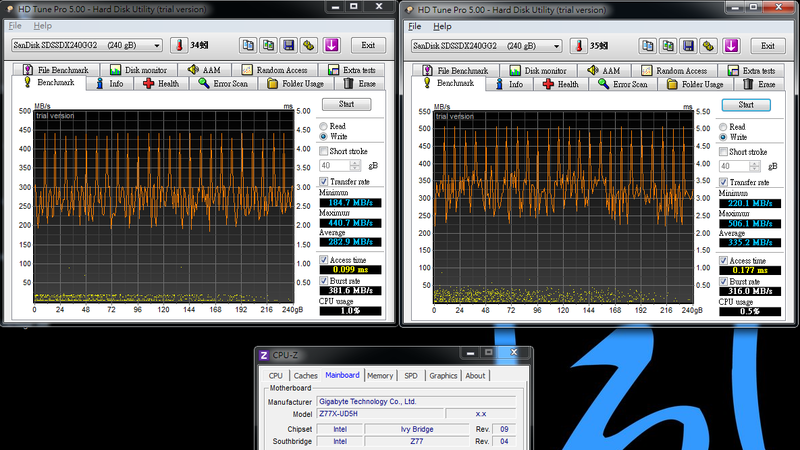 HD Tune Pro 5.00 set Black Size as 1MB can have the best performance. 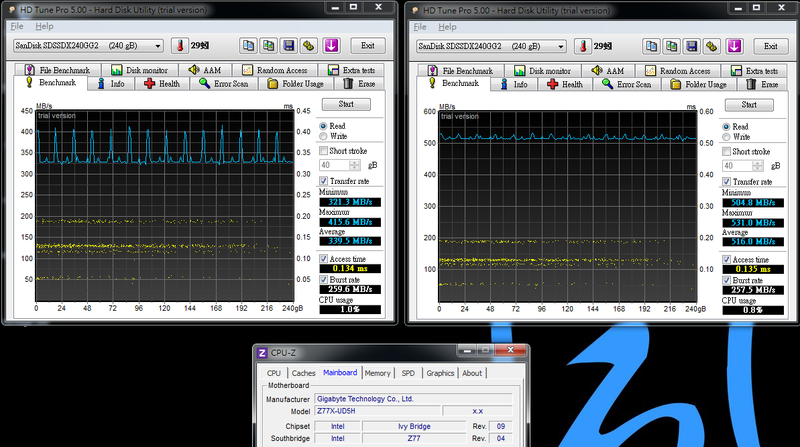 HD Tune Pro 5.00 revises File Benchmark to be more detail. There are more paramaters for reference. 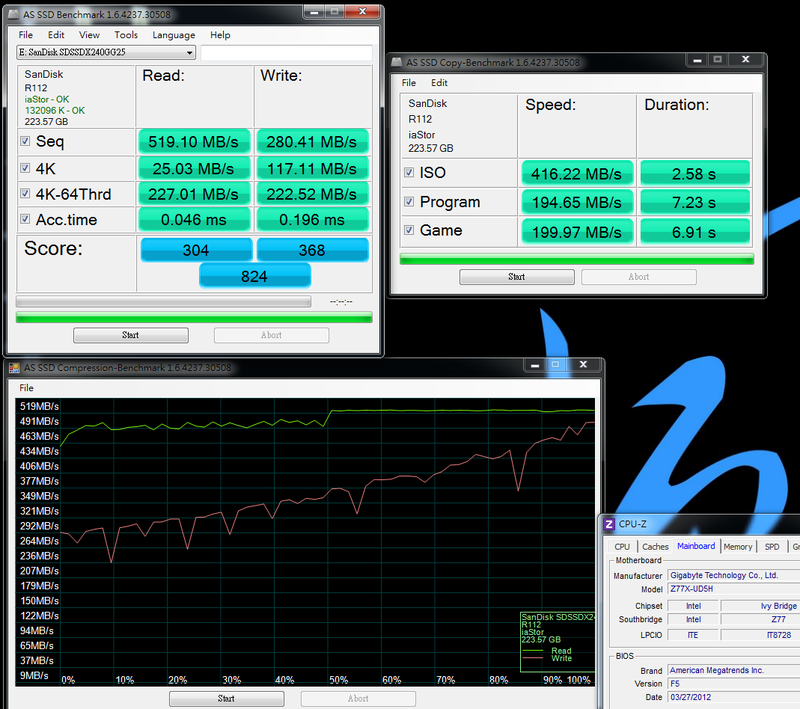 ATTO DISK Benchmark test result is over official Read 550 and Write 520 MB/s. CrystalDiskMark default test is random, As right-hand picture, the Write performance is lower. This part is caused by SandForce controller structure. The performance will be lower as algorithm. Left side CrystalDiskMark test changes to two pure sequential mode. The Write is close to official spec. SandForce has special algorithm in Sequential Write. The speed starts from 280MB/s and ramp to 500 MB/s slowly. This is also a weakness of SandForce controller. SandForce structure will be changed by SSD capacity. 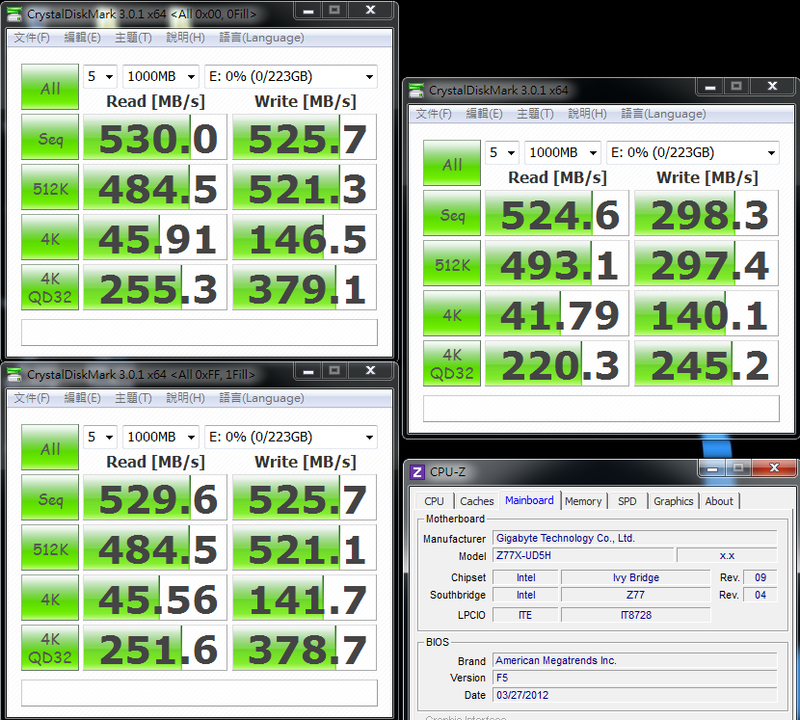 AS SSD Benchmark with 120GB is only 500, but it improves to 700~800 with 240GB. You can see 240GB Write Seq/4K-64Thrd is much better than 120GB. AS SSD Benchmark in personal experience, the ratio is more on 4K and 4K-64Thrd. In these 2 items, if the transfer rate is higher, the total will be higher as well. 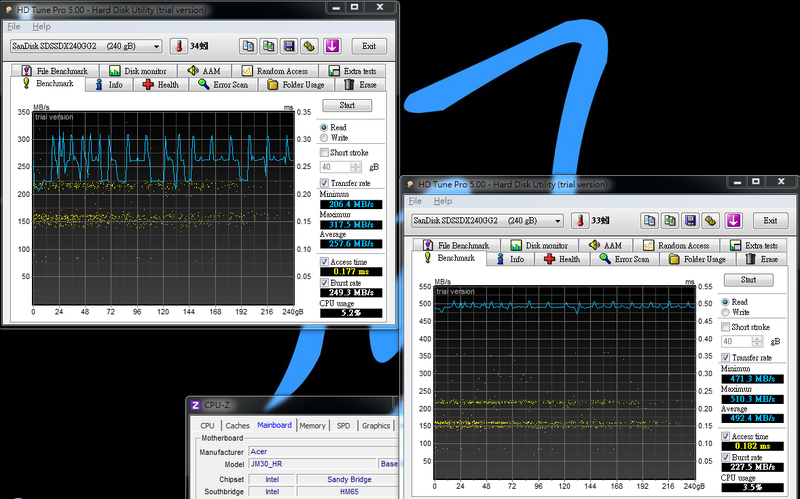 IOMETER 2008 test, you can see the first minute I/Os is extremely high. If the test keeps for 3 minutes, the I/Os becomes lower. 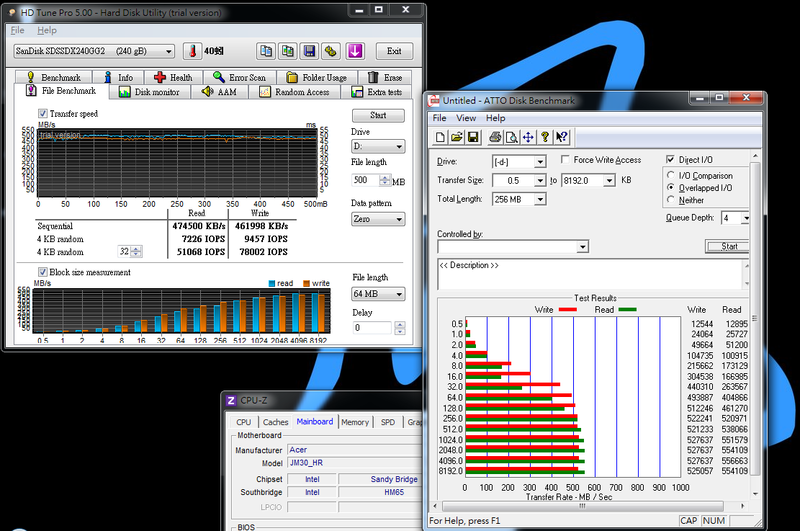 However, it?s still higher than official sepc, max Random Read/Write 39K / 83K IOPS. Above-mentioned, SandForce controller has special algorithm for Sequential Write. It leads to the performance speeding. Internet said it designs for reducing writing numbers to increase SSD life. Anyway, only sequential write can achieve 500 MB/s. For random test, Write is only 180~280 MB/s. Besides this, Read or 4K is good performance level. SanDisk uses NAND Flash synchronize IC, the performance is not lower than Intel or Micron IC. SandForce controller has been in the market for a while. SanDisk SSD can have more competitive price. Second part is NoteBook test. 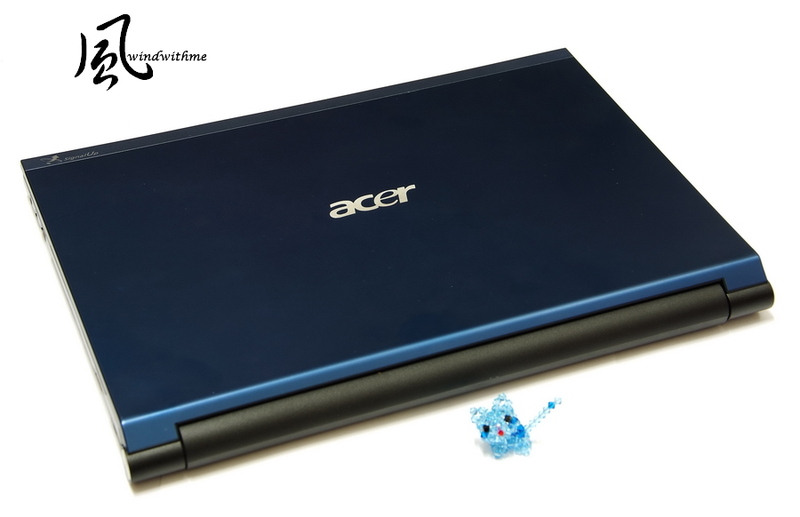 I still use acer TimelineX 3830TG for performance test. I have been using this NB for several SSD reviews. The performance won?t be impact by SATA performance. If I get Ivy Bridge NoteBook in the future, I will move to latest Intel chipset one. 3830TG color is very eye catching. The upper cover is aluminum also. The body is also slim. Intel chipset is HM65. 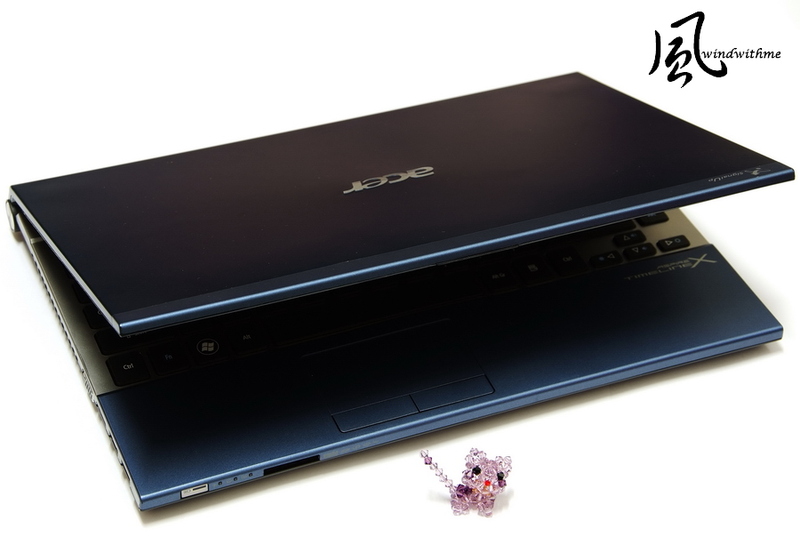 In NoteBook, it has better SATA3 transfer ability. 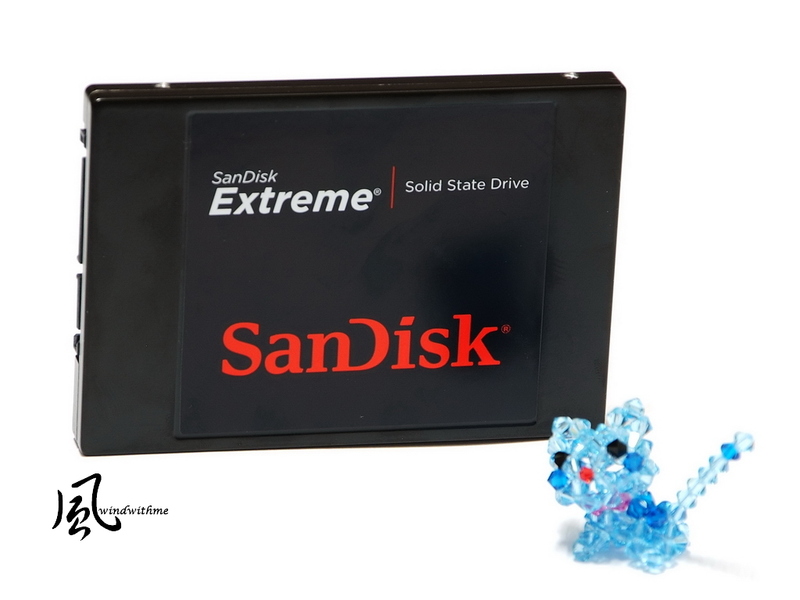 SanDisk Extreme 240GB install at SATA3 as system drive. OS is Windows7 Ultimate 64bit, all drivers and Intel Smart Response Technology. 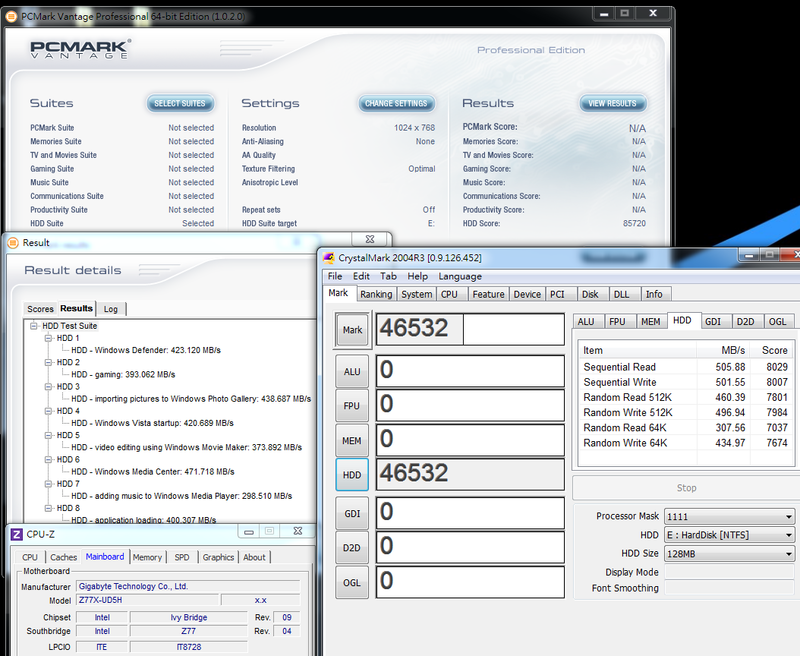 ATTO DISK Benchmark over 1024k test, max Read is 556.6 Mb/s and Write is 527.6 MB/s. NoteBook SATA transfer rate is around 10% lower than DeskTop, especially 4K Write. 3830TG SATA3 transfer rate is lower than PC, but it?s still acceptable. 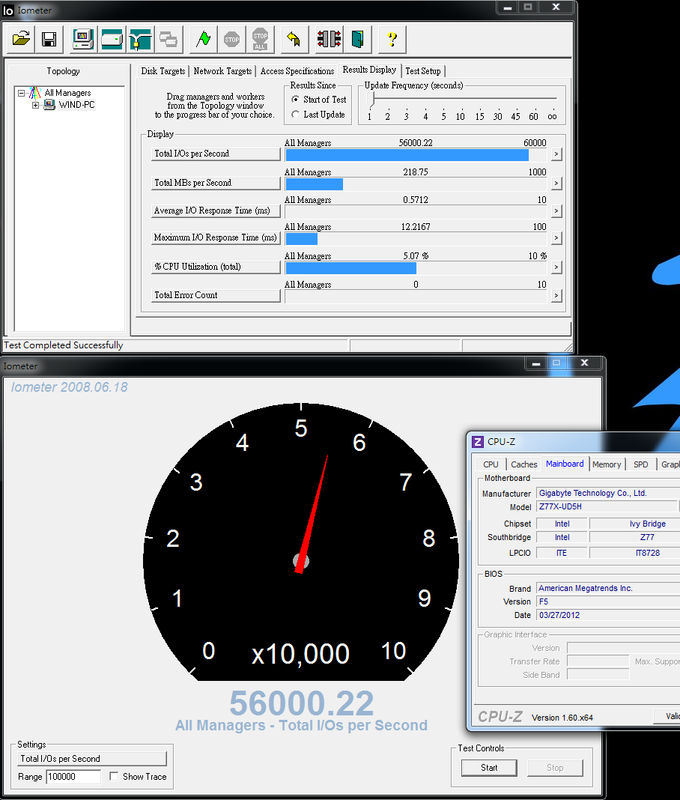 Previously, I use TOSHIBA MK6461GSY 640GB 7200, Time to Desktop was 42 seconds. 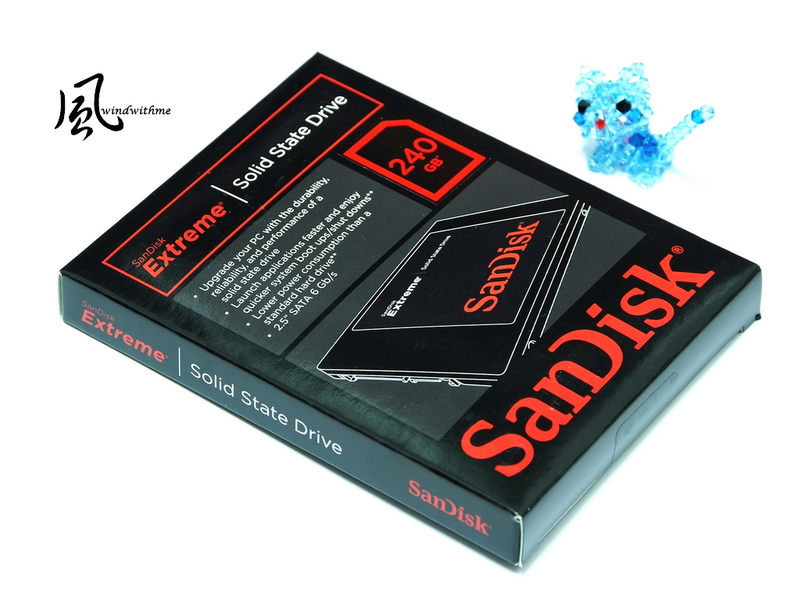 SanDisk Extreme 240GB in Time to Desktop is 15 seconds. I use same NoteBook for both drives and install same drivers and software. SSD really can speed up NoteBook. SSD booting speed is 2.8 times faster than HDD. Of course, starting software is also much faster, especially you can feel for bigger files. These three years, SSD all drop price annually. It can encourage users and market to move to SSD. In 2010, 32GB was 120USD and 64GB was 220USD. Last year, 64GB was 120USD and 128GB was 220USD. This year, the market is starting to wriggle. Recently, 120/128GB and 240/256GB are starting to drop price in some regions. 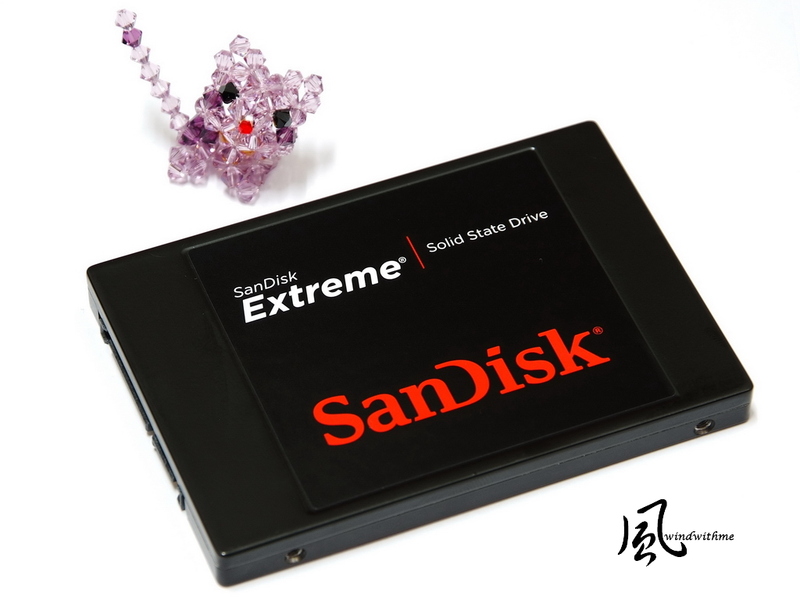 SanDisk Extreme 240GB price in Taiwan is 7800NTD, around 266USD. Using SandForce SF-2281 high speed controller and synchronize NAND Flash IC to own high performance. This cost performance can be the lowest price in same market position. SanDisk just comes into SSD market and go straight to low price and high performance product line. If they also provide good warranty and firmware upgrade, SanDisk can be a new brand with high C/P. After a little bit of research I decided to not go for the cheapest this time and decided for this exact SSD too. But I am still not disappointed. But it's not even near being cheap. So much more expensive per GB than conventional hard disks..
What's your hw like, when on x64 the kernel takes 1.5s? A distro kernel? Also e4rat-lite which preloads 100 or so files before calling init. 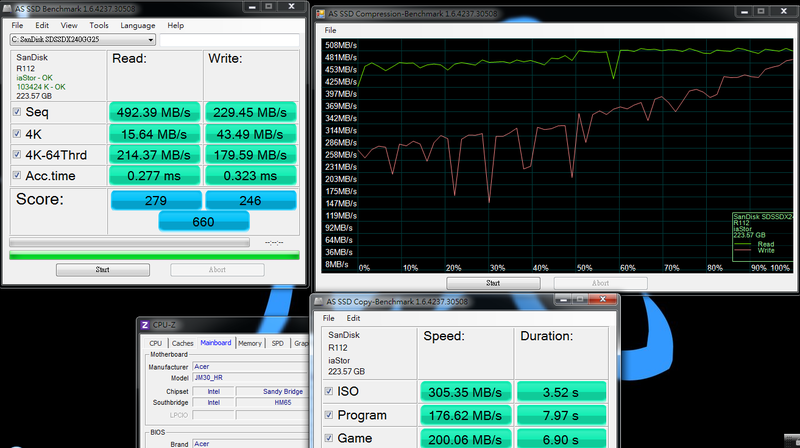 Even on SSDs it brings a noticeable speedup. Not sure if systemd has knowledge about that time and adds it to the kernel time. I can test it again but I have the impression that it reduces the boot time by at least 1 second. But there were a lot of systemd updates lately in arch testing so maybe there was a speedup.